As I think I have mentioned Zach loves to “shoot”. All. The. Time. I had put away his baby hoop in his closet but he spotted it once when his father was in charge. I was initially annoyed as I try to keep a rotation of the plastic junk toys ﻿that keep him happy so that they are not ALL in my living room. 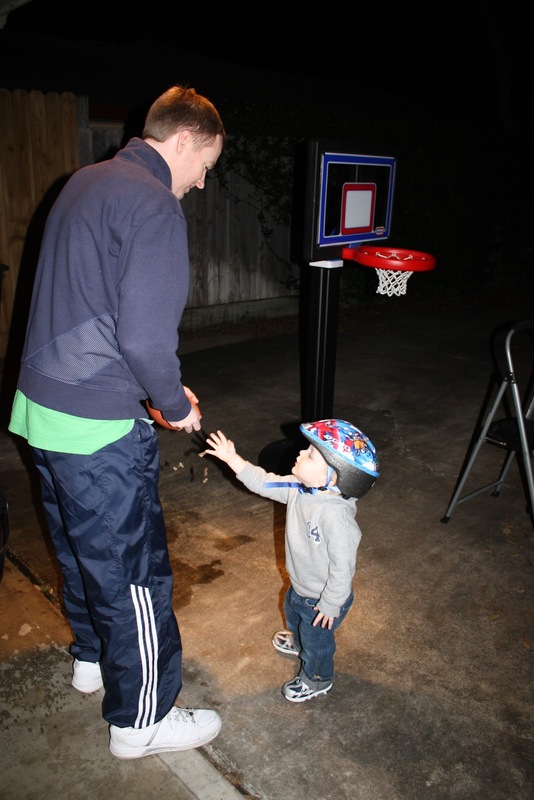 But the mini hoop has actually kept him busy when he can’t go outside and shoot at his big hoop. Which he wants to do every day. He is not satisfied with throwing the ball up towards the hoop (to be fair it goes up about 2 inches) he wants you to hold him so he can shoot. My patience with that is highly limited so I came up with the idea of letting him climb on his stool and shoot from up there. 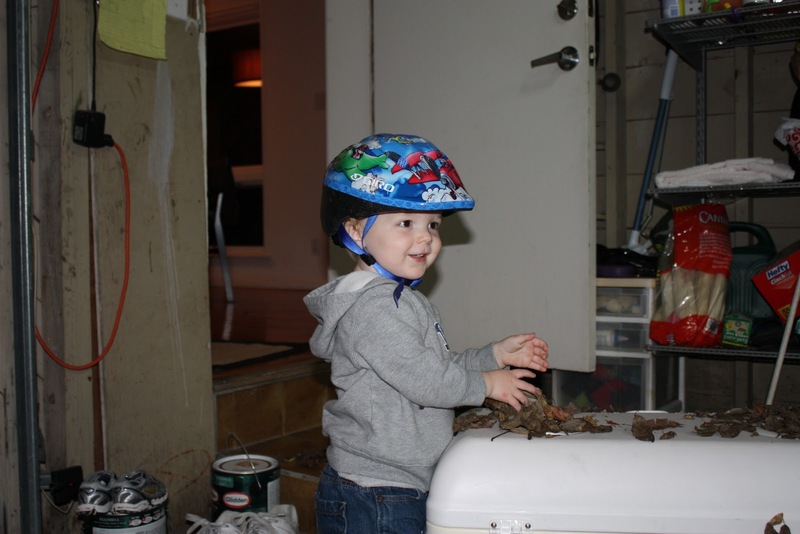 The downside is that he is a 2 year old, climbing, carrying 1-2 balls with concrete under him. I actually thought none of it (my under-parenting is highly documented) but my friend KK mentioned something about her son wanting to climb too and she thought he would fall off. That was literally the first time it occurred to me that he could fall off. Onto the concrete. Bad, bad parenting. My solution? He now has to wear his bike helmet while shooting. 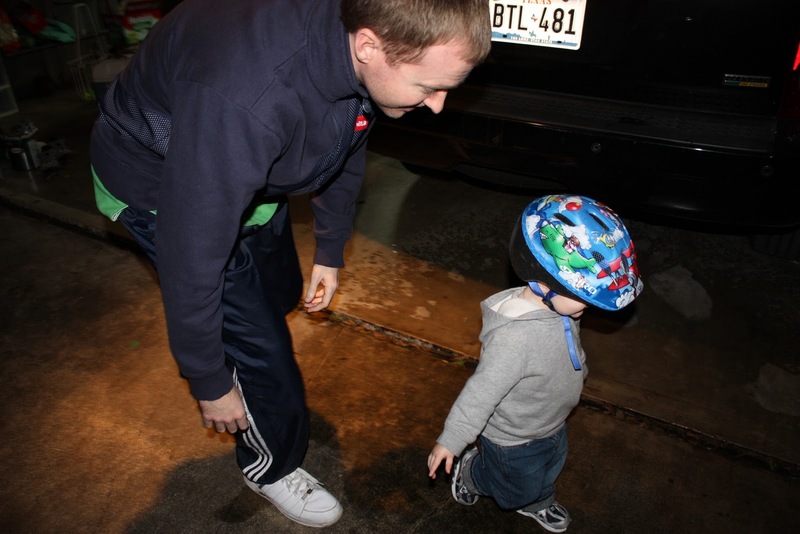 No, I am still not standing out there, the helmet is parenting for me. I am glancing at him from the kitchen window while I make dinner. Oddly enough he loves it. So much that he wears it while collecting leaves, running around the driveway and being chased by his dad. Safety first my friends, safety first.